Blagoveshchensk-on-Amur is not one of the more notable destinations in the Russian Far East. That status belongs to Khabarovsk and Vladivostok. Nonetheless, since the 1850s, Blagoveshchensk (almost 8,000 km east of Moscow) has anchored Russia's critical southern boundary with Manchuria along the Amur River. Russian Cossacks and explorers attempted to gain control of the north (left) bank of the Amur as early as the 1640s, establishing a fort, Albazin, on the Amur in 1651. After a prolonged siege of the fort by Manchu forces in 1685-1686, Russia was compelled by the Treaty of Nerchinsk (1689) to abandon the area north of the Amur and retreat west of the Argun River. It wasn’t until the mid-19th century that substantial Russian forces returned to occupy the territory, under the leadership of Governor-General Nikolai Muravyov. Muravyov was subsequently given the title “Amursky” for his role in the acquisition of the territory for the Russian empire. China, weakened by the Taiping Rebellion and the Second Opium War, was forced to recognize the Russian presence by the Treaty of Aigun (1858), which ceded to Russia vast arable lands north of the Amur. The town of Blagoveshchensk (from the Russian word for Annunciation) was founded that same year, near the point where the Zeya River empties into the Amur. Its population expanded gradually, largely on the basis of active trade and transportation along the Amur and its western tributaries. The relationship between the Russians and Chinese in the area remained tense, however, and in summer 1900, during the Boxer Rebellion, the town was shelled by Chinese insurgents across the Amur River. Fearing an internal threat, Russian authorities expelled the Chinese inhabitants of Blagoveshchensk under harsh conditions. 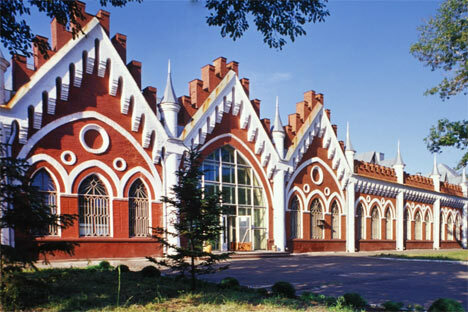 Although not situated on the main track of the TransSiberian Railroad (a 110-km spur from the main line was completed in 1915), Blagoveshchensk flourished in the early 20th century not only through trade, but also by virtue of the surrounding fertile agricultural land and the presence of gold deposits, which created a local gold rush. The gold assayer's building still stands in the center of town. The town’s prosperity was reflected in a number of imposing commercial buildings that survive to this day, including department stores, trading centers and flour mills. The town also built a number of educational institutions, whose size would rival those of American cities. Indeed, the city had a strong American commercial presence—particularly in agricultural equipment—which was reflected in the “American Lane” in the central commercial district. Blagoveshchensk also had houses of worship for many confessions, including Russian Orthodox, Roman Catholic, Molokans (sectarian pietist Christians), and a small synagogue. According to the 1913 census, Blagoveshchensk had some 70,000 inhabitants. Unfortunately, the city’s growth and prosperity was severely damaged by the violence of the Russian Civil War, which raged in Siberia until 1921. Until 1920, the city was under the control of White forces, supported by a Japanese occupation contingent. Between 1920-1922, Blagoveshchensk was part of the Far Eastern Republic, a nominally independent area allied with the Russian Soviet Republic and serving as a buffer between it and Japan. With the withdrawal of the Japanese in 1922, the Far Eastern Republic became a part of the RSFSR. Tensions again rose in the region with the Japanese occupation of Manchuria in the 1930s, and continued until the victorious conclusion of World War II in September 1945. Since 1932, Blagoveshchensk has been the administrative center of the Amur Region, and it continues to occupy an important strategic position in the Russian Far East. The city, whose current population is around 220,000, is part of a free trade zone with the rapidly growing Chinese city of Heihe, situated on the opposite bank of the Amur. Despite its modest size, Blagoveshchensk has significant potential through expanding economic cooperation with China on both a regional and national level. This is particularly promising in the major development of energy resources between Russia and China. At the same time, Blagoveshchensk has managed to preserve much of its valuable architectural heritage of a century ago—a time when the energetic young city looked to the future with such hope and faith. A strong Regional History Museum provides an essential link with the city's cultural heritage. During the Soviet area, houses of worship were destroyed or closed, but the Russian Orthodox Church has recently rebuilt or restored a number of church buildings. In addition to imposing commercial buildings, a number of the city's early houses, in brick and wood, remain, with their ornamental details. The presence of these buildings is a reminder that the strong beginnings of the city’s pioneers can provide an inspiration for further progress.